"The goods arrived this morning. Super fast and efficient. Thank you very much." New Aeroflow QR Fittings with one Bulkhead End - Aeroflow has expanded the range of their popular Quick Release Fittings by adding a bulkhead end on their EPDM-sealed 3AN and 4AN QR fittings for brake and clutch hydraulics. 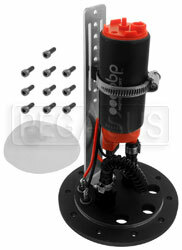 The extended male AN fitting lets you mount the set in a panel or bracket. New obp FST Fuel Surge Tanks and Pump Clusters - Prevent fuel starvation by adding a surge tank without modifying your existing fuel tank. FST tanks and high-pressure pump clusters are designed to interchange with Fuelab, Protec, and Aeromotive "Stealth" pump clusters. New Setrab HyperFlow Spin-On Lifetime Oil Filters - The billet aluminum body on these spin-on oil filters can be disassembled to clean and inspect the stainless mesh filter element inside. A powerful magnet catches any ferrous particles before they have a chance to clog the high-flowing filter. Three popular thread sizes available. Our AiM Practical Data Acquisition Seminar returns for the 9th year! We will be holding our 9th Annual AiM Data Acquisition Seminar on Saturday, March 16th, 2019 - Learn how to turn your AiM data into faster lap times. The $35 cost includes catered lunch. 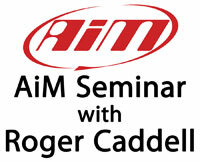 Attendees also get discounts on all AiM products on the day of the seminar. Seating is limited, and openings are filling up quickly. Reserve your spot today! 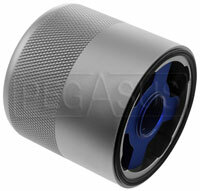 Free Shipping* on the AiM SmartyCam HD GP 2.2 - This rugged mini video camera was designed specifically for racing. Connect it to your AiM data logger to record speed, RPM, and more right on the screen. The new v2.2 version can also connect directly to your ECU for engine data. 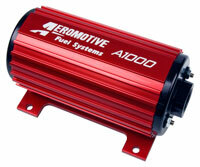 The aerodynamic remote bullet camera is ideal for open cars (formula cars and open sports racers). 87 degree lens standard for use on open cars. Free Shipping* on the AiM GPS08 Module - The GPS08 Module plugs into your AiM data logger (MXL, MXL2/MXS/MXG, EVO3, MyChron4/MyChron5) or SmartyCam HD GP 2.2. Uses GPS and Glonass satellite data for position, speed, acceleration, lap timing, and super-accurate track mapping. Free Shipping* on the Bosch 044 High Output Fuel Pump - This genuine Bosch roller-vane fuel pump (Bosch FP200) is capable of delivering up to 53 gallons per hour (200 liters per hour) at 72 psi. It is OEM on many European performance cars, and has several decades of racing victories. 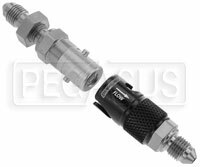 We also offer a wide range of Bosch 044 Fuel Pump Adapter Fittings to help you connect the pump to just about any fuel system. 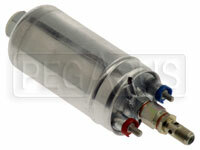 Facet Electric Fuel Pumps - We have over 40 different models of Facet solid-state electric fuel pumps in stock. Choose the compact Cube Style (12v or 24v), the higher-capacity Cylindrical Style (12v or 24v), the self-priming Dura-Lift series, the quieter Posi-Flow series, or high-pressure pumps for fuel injection. All operate without rubber seals or diaphragms, so they are compatible with a wide range of fuels, including pump gas, alcohol blends to E85, and diesel. Free Shipping* on the Aeromotive A1000 Fuel Pump - This is the pump that earned Aeromotive their reputation as innovative world-beaters in high-performance fuel systems. Powerful enough to feed 1300 HP fuel injected racecars or 1500 HP carbureted monsters, yet it can still be tamed for reliable use in a daily driver. We also offer matching Aeromotive A1000 Accessories including fuel pressure regulators and a pump speed controller for street use. Free Shipping* on the Longacre Computerscales Wireless XLi with Tablet - Is your New Year's resolution to lose weight (from your racecar)? This pro-quality digital scale kit takes full advantage of the color screen on a wireless tablet computer to show you more information than ever before. The complete system even includes a 7" tablet with pre-loaded software. Free Shipping* on the ART Laser Scale Leveling System - This precision laser measuring system makes it quick and easy to determine if your scale pads are level with each other. Includes a 6x6 inch granite reference plate with adjustable leveling feet, a precision 2-axis level, a super-bright laser, and 4 calibrated targets for the scale pads. 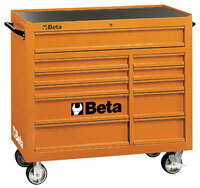 Beta Tools C38 11-Drawer Rolling Tool Cabinet - This tough roller cabinet has old-school style. Five wide drawers next to 5 narrow drawers (6 shallow, 2 deep) are complemented by a deep full-width drawer above. Each drawer front has reinforcing channels along the top and bottom for extra strength. 42 inches long x 18 inches deep x 40 inches high. Ships via Truck Freight (not eligible for free shipping). Did Santa forget to bring you that shiny new set of radios you asked for? Whether the big man came through for you or not, Pit Boards remain one of the most effective ways to get information to a driver on track. Even in pro racing, pit boards are used to supplement pit-to-car radios. 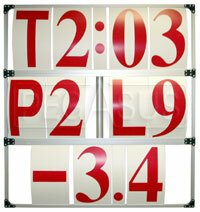 And with a pit board, your day will never be ruined by the dreaded "batteries not included!" Congratulations to everyone who participated at the 2018 Runoffs®! If you received a Pegasus Contingency Award, be sure to use it before it expires at the end of next month. We have many large and heavy items in our inventory. That has made it difficult for us to offer a wide-ranging free shipping policy. Yet we realize that free shipping is important to many of our customers. You spoke and we heard you. More than 99.7% of the items in our inventory now qualify for Free Shipping on orders over $199 shipped to the 48 states within the continental US. There are a few exceptions (mainly Roll Bars, Roll Cages, Beta tool cabinets, Racing Seats, and full sheets of Jabroc). We've tried to keep the exceptions to a minimum. Orders with free shipping are shipped by the most economical method of our choice. Air shipments and other orders with paid shipping are given priority in our warehouse, so orders with free shipping may not always ship the same day. However, if you have a few extra days available in your schedule, you can save significantly with our new free shipping policy. Note: Our Free Shipping policy applies to retail customers only. For more information, click any of the above photos or call 1-800-688-6946 during business hours.